Many don't know that colposcopes were never designed for forensic use. 35mm video cameras and even good quality digital cameras have been mounted on colposcopes in an effort to capture forensic photographic evidence. The results have been exceptionally poor for many reasons including the fact that the light, lens and camera are not in sync. Additionally, colposcopes are difficult to learn and to use, difficult to move, position and extremely limited in their use. It is rumored that an examiner “must” see trauma with their own naked eye before testifying in court. This rumor is misleading and untrue. If it were true, you would not be allowed to use a colposcope or even wear eye glasses while performing an examination, because eye glasses, contacts, colposcopes, X-Rays, CAT Scans, MRI's and digital pictures are all considered to be visual aids. 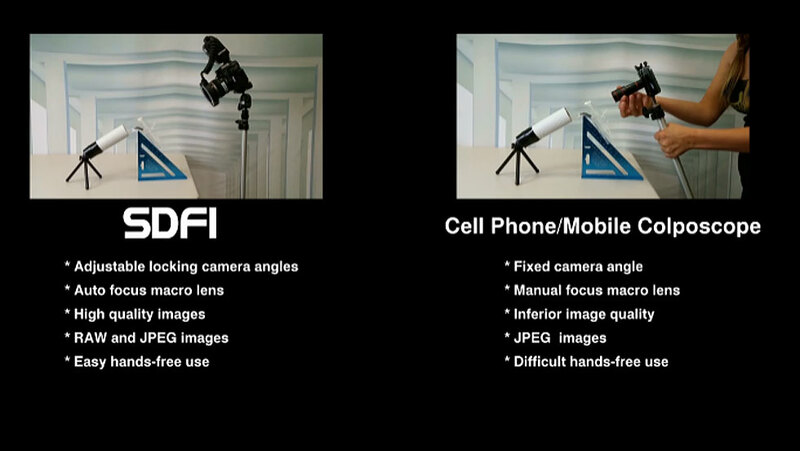 The SDFI®-TeleMedicine Camera System produces pictures that are better than the best digital colposcope picture.